When one goes to a research library, one usually submits a request by call number, then waits while an attendant goes off to locate the book in a locked, enclosed room. When they come back, cards and permissions have to be filled out. Finally you get to view the book. My experience at the Watkinson Library at Trinity College was quite different. the book. But what I really needed to see was the last edition, the tenth, held by the Watkinson Library. When I arrived I was greeted cordially in the Library. I filled out an information sheet. I met Richard Ring, who greeted me like an old friend and who had the book in question already waiting for me. Yes, I could take photographs. Credit only to the Watkinson Library. No fee. I was grateful, since this project is not supported by a grant. My view of the book allowed me to corroborate that what the father wrote in this book had been repeated in the son’s autobiographical volume forty years later. 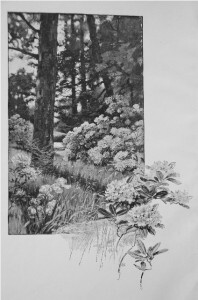 I could also see that the frontispiece used by the father, a detailed drawing of rhododendrons characteristically exceeding their frame (attached), signed by W[illiam] Hamilton Gibson, noted author, naturalist and illustrator of the period, was used again by the son in his small volume coming out of his talk to the Massachusetts Horticultural Society two years after the publication of his father’s book. Viewing the book confirmed, among others things, the close relationship of the work between father and son, important members of the four generations. My thanks to Rick Ring and his staff at the Watkinson Library at Trinity College for collecting, preserving and making available such books and information. In the process of cataloging a collection of over-sized volumes (folios) from the Watkinson Library I have discovered several items of interest. 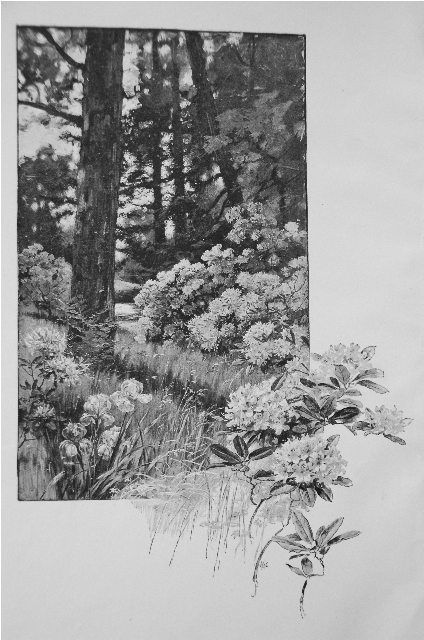 Because of their size many folios have remarkable illustrations or maps. Pictured here is a portrait from McKenney and Hall’s History of the Indian Tribes of North America, published in Philadelphia, 1837-1844. This 3 volume set contains 120 colored lithograph portraits copied after paintings by Charles Bird King in the Indian Gallery of the U.S. War Department. When noteworthy Indians visited Washington it became the custom to have their portraits painted. Thomas McKenney was the superintendent of Indian Affairs at the time and got to know some of the people of the native nations. 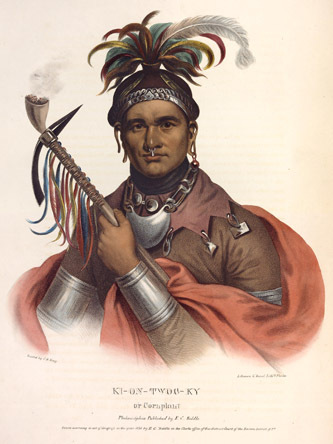 The book also contains biographical sketches by McKenney and a history of the tribes by James Hall. [NB: Most of the original portraits were destroyed in a fire at the Smithsonian in 1865, so the set is a vital historical record. –R. Ring, Head Curator]. You are currently browsing the I Found It at the Watkinson! blog archives for January, 2011.